Big news this month in DC Comics's March 2014 trade paperback and collections solicitations seems to be what is, or isn't, coming up in Frank Miller and Jim Lee's All-Star Batman and Robin, given the solicitation of an Absolute volume that collects the unfinished series. Before we dive into it, however, one Cancelled Comics Cavalcade note: DC has apparently cancelled orders for the Katana collection by Ann Nocenti, promising to resolicit the trade. This isn't the first time DC has cancelled and resolicited a New 52 trade (the second volume of Deathstroke and Savage Hawkman are examples), but it is curious since there's nothing to add to the book; it was already supposed to collect the whole series, issues #1-10, plus the Villains Month Justice League Dark 23.1: Creeper issue. Might the resolicit contain less (like, not the Creeper issue) and not more? I never read All-Star Batman and Robin the first time around and I don't have an interest in reading it now, so the fact that the solicitation for the Absolute edition offers issue #1-9 -- essentially promising that the book's final issue, #10, will never see light of day -- doesn't bother me all that much. But if you bought nine issues of this series, especially if it was ever offered to you as a ten-issue miniseries -- and especially given that half of the creative team is a high-ranking executive with DC Comics -- I can understand why you might be miffed. It also seems a little callous to be releasing an Absolute edition of an unfinished series without some official statement as to whether yes, this series will one day be finished or no, we just have to cut our losses. If for some reason DC and the creators can't get this series done, I think we'd all understand that stuff happens; the problem in my opinion is that there's simply been no statement, and instead an Absolute solicitation that glosses over the inherit problems and therefore comes off looking blithe. On the other end of the spectrum, the long-awaited JSA Omnibus now has a release date, May 14, 2014. This also marks a triumph of you, the reader, who made your voices heard when this collection was going to start with issue #6, and now it'll start with issue #1 (and the Justice Society Returns prequel miniseries). If you spoke up again, could you make new All-Star Batman and Robin appear? ... Probably not, but I still always encourage voting with your wallet. The fourth collection of Scott Snyder and Greg Capullo's Batman run includes issues #21-24, skipping over issues #18-20. Many of you have asked, and yes, I do think DC will collect these issues eventually, probably after all the Zero Year collections. Aquaman Vol. 4 picks up from the controversial Vol. 3, which only collected issues #0 and #14-16, all but one of which was collected in Justice League Vol. 3 (Update: the constant changes to the Aquaman Vol. 3 contents remain confusing; I'm told the Aquaman Vol. 3 trade had two issues not found elsewhere). In another decision that will please no one, Vol. 4 collects issues #17-19 and #21-25, making it a hefty eight-issue trade but skipping #20, a fill-in issue by John Ostrander. Whereas I do think we'll see Scott Snyder's Batman #18-20 collected somewhere, I'm less enthusiastic about Aquaman #20's chances. It is enough to make me consider just going digital with this series. Gail Simone's Batgirl Vol. 3: Death of the Family offered some really gripping storytelling, and I'm very excited for this fourth volume. Includes Batgirl #19-25 and the Villains Month issue Batman: The Dark Knight #23.1: Ventriloquist. An eight-issue Batgirl collection is a nice take in my opinion. Collects the entirety of Art Baltazar and Franco's Green Team. Not sure the tie to the ongoing DC Universe was ever quite enough for me to pick this one up right away, unless someone knows otherwise. I have been enjoying Matt Kindt's head-trip Mind MGMT very much, and so I'm eagerly anticipating his bringing that spy-thriller vibe to Suicide Squad. Kindt's contribution to this volume is only the Villains Month Justice League of America #7.1: Deadshot and Detective Comics #23.1: Harley Quinn (along with Ales Kot's issues #20-23); more of an appetizer, really, but one I'm looking forward to. The long-rumored Paul Dini/Joe Quinones graphic novel also now has a release date, May 21, 2014. You all should read and enjoy this, sure, but my shameful comics secret is that I've never been on the Paul Dini/Zatanna hyper-bandwagon, really; I thought Dini did a nice job with Zatanna and Batman in some recent issues (not so recent any more) issues of Detective Comics, but the graphic novel lovefest isn't for me. If anything, it'll be a trip to see the pre-Flashpoint Black Canary again. I've mostly passed over these classic Deadman collections, but the fact that this one collects the post-Crisis on Infinite Earths 1986 Deadman miniseries piqued my interest -- could it be DC Timeline fodder? From what I can tell, the contents of this one are a little strange; it collects Challengers of the Unknown #85-87, a time-traveling Deadman story from 1978, and then the Deadman miniseries and Secret Origins issue which are related, but follow from Brave and the Bold #86, collected back in Deadman Book Two. Chalk it up to Crisis, but maybe this would be a better read without the Challengers issue and with another more modern story alongside the 1980s bits, like the Spectre or Action Comics Weekly issues. This newest "new edition" of Final Crisis now includes the new pages from Absolute Final Crisis, plus everything that was in the original book and the two Batman issues. I reviewed the two-volume set of Denise Mina's adaptation of Stieg Larsson's The Girl with the Dragon Tattoo and liked it, though I thought splitting it into two volumes hurt the story as a whole. Therefore I'm glad to see DC/Vertigo releasing The Girl Who Played with Fire as one single volume, and also the paperback edition of Tattoo will contain the first two volumes in one. Whether this better allowed Mina to not have to artificially split the story, or whether the script was done before the final format was decided, I don't know. This series has been critically panned, but I might just check it out in digital anyway; surely there must be some enjoyment to be found in He-Man and Superman on the same page. Collects the six issue miniseries, plus the classic DC Comics Presents issue that first teamed He-Man and Superman. As they well should, DC's quest to reprint everything Superman/Batman ahead of the new movie continues with this paperback of issues #1-13, originally published as the "Public Enemies" and "Supergirl" storylines. This is essentially the contents of the recent Absolute edition, now in paperback. Personally I'd love to see a Superman/Batman omnibus that collected the entire series, for better and for worse, including some of the self-contained stories by rotating teams toward the end. Alongside a number of classic Carmine Infantino Batman stories, I think it's cool that DC is including the story Geoff Johns wrote and Infantino drew in tribute to Julius Schwartz in 2004. That's what jumped out at me. In our last solicitations run-down of 2013, what's on your buying list? I hope Ostrander's fill-in issue is collected in Aquaman vol. 5, along with the annual he wrote. And as good as Matt Kindt is, what really makes Suicide Squad vol. 4 worth buying is Ales Kot's stellar 4-issue stint. I wish he was still writing this series. The Aquaman collection annoys me since it looks like it's skipping #23.1 and 23.2 (the FOREVER EVIL Villain's Month one-shots focusing on Manta and Orm and which Johns co-wrote). The absence of Manta's one-shot from the collection is fine given that it mainly transitions the Manta subplot into FOREVER EVIL. It has no bearing on DEATH OF A KING. But the absence of Orm's one-shot is unfortunate since it's kinda important to Johns' long-term plans. I can't give away too much without spoiling things. And I'm not going to collect an entire hardcover just to get one issue. I really hope DC rectifies this before May. Come to think of it, you're right. The events of the Ocean Master one-shot were briefly mentioned in Johns' last issue. I guess the problem is that Trinity War and Forever Evil are somehow supposed to fit in between pages 27 and 28 of Aquaman #25, which would make the one-shot's inclusion in vol. 4 a bit problematic, unless it was as an extra story in the back of the book. Yeah, the timeline between Johns' last AQUAMAN arc and FOREVER EVIL makes no sense -- which is dumb since Johns gave himself a perfect out as you mentioned. It would have worked if Arthur had just left the League after THRONE OF ATLANTIS. I'm guessing either Johns changed his mind or DC wanted him in TRINITY WAR. And this lack of collection also contradicts Didio's statements that the relevant Villain's Months specials would get collected with the monthly series (ex. The Flash). As important as this single issue is, I'm not buying an extra hardcover solely for one extra chapter. I have to think that Batgirl solicit is wrong... #26 is the actual end of the Wanted arc, and I can't believe the trade would stop with the Zero Year diversion (which wasn't even written by Gail Simone). Plus, #27-on seems to be going in a different direction altogether. As for the missing Snyder issues, perhaps they'll be collected in the Clayface trade of The Dark Knight? That might be a lot of clay for the average reader, but with the recent cancellation of TDK, a shot of Snyder might boost the trade sales. Finally, Superman/Batman #7 finally gets collected? Cool! I tracked down the single issue a long time ago as a completist (Robin and Superboy fight the Toyman), but it's nice to see a "lost" Loeb chapter reunited with the rest of the series. Wonder if they'll do the same with #26, which is about Loeb's son...? Superman/Batman #26 was in the recent Absolute Superman/Batman Vol. 2, so that suggests to me it'll be in the next "omnibus" paperback volume, too. Adding Snyder to the TDK volume would certainly make me more likely to get it. *Inhumanity HC--This is either going to be delayed because of the pushing back of "Inhuman" #1 to April, or they'll drop that issue from the trade. Otherwise, a good chunk of this collection is made of titles I get independently, like "Avengers Assemble" and "Mighty Avengers". *Marvel Masterworks: Captain Marvel Vol. 5--I've officially lost count of how many times Marvel has published the original "Thanos gets the Soul Gems" story. This might be an interesting read to see what happened to lead up to those famous Annuals, though. *Spider-Man Firsts TPB--This is an interesting idea. The only issue missing is the first issue of the Amazing relaunch, but considering how reviled that whole idea was and how it was "ghost-numbered" with the old numbering, it's not a major loss. *Marvel Knights: Spider-Man TPB--I've heard mixed reviews about this title, but Matt Kindt is usually worth a read even when he's writing for the Big 2. *Daredevil by Mark Waid Vol. 5 TPB--This isn't coming out til March? I may have to switch over to the hardcovers or just get the rest of the title on Comixology, because I want to follow the relaunched version from the beginning. *Not a great month trade-wise, IMO. April will see the release of the next "Captain America" movie, so we might get some good Cap trades then. *Murder Mysteries HC--Neil Gaiman writing a Miltonian murder mystery with art by P. Craig Russel?! Sold! *Hellboy in Hell Volume 1: The Descent TP--As long as I can follow this without having to pick up numerous volumes of backstory, I'll check it out, especially since Mignola is writing AND drawing it. *Sledgehammer 44 TP--Iron Man meets World War 2 in another series that I never heard about before but sounds very cool. *Rocketeer/The Spirit: Pulp Friction TP--Mark Waid's been doing a tremendous job with the various "Rocketeer" mini-series, and upping the ante by introducing the Spirit looks like it makes for some excellent results. *Fatale Deluxe Edition Vol. 1 HC--I know there are many readers of (and writers on) this blog who love Brubaker and Phillips' collaborations, so this looks to be right up that alley. "*Fatale Deluxe Edition Vol. 1 HC--I know there are many readers of (and writers on) this blog who love Brubaker and Phillips' collaborations, so this looks to be right up that alley. " Yes! Me! This is exactly what I've been waiting for and why I haven't buying those little trades. Awesome. I have the original Final Crisis TP. Does anyone have the absolute edition and tell me if the additions in the new TP would justify a rebuy of the book or is this just padding? I would like to echo this question. I have the original single issues. I wouldn't mind getting a trade but I'd rather not need to. I think its worth it. The new pages to #7 increase the epic scope of the final battle, and I was never sure why the batman issues weren't there to begin with. They always should have been part of "final crisis" instead of the RIP collection, where they seem really out of place. The inclusion of relevant pages from DC Universe: Zero (Darkseid's fall thorugh space-time, Libra's first meeting with the Society, Barry Allen's return to life), the full Final Crisis Sketchbook and material from Final Crisis Secret Files are also great additions that made the Absolute a more complete, satisfying collection than the original HC and TPB. Why in the world isn't Batman #0 included in the first Zero Year collection, since it has yet to be collected and features the Red Hood Gang? I am sorely tempted to skip all the Zero Year collections altogether, as it is entirely likely that the whole saga will see a deluxe edition or an absolute edition. I've seen some other sources announcing that both the zero issue and the annual will be in this trade, and that is the most likely since New 52 trades normally have 6 or 7 issues. I was expecting to get issues 18-20 , but I guess I'll have to wait. This trade makes a lot more sense without anything not labeled as Zero Year. * I assume that Batman, Vol. 4 contains #0, #21-24 and Annual #2. Those are the contents listet on Amazon and it absolutely makes sense. * CE, you mentioned that Aquaman, Vol. 3 only included one extra issue compared to Justice League, Vol. 3. That's not correct, it also included Aquaman #14, which was not in the JL collection. Therefore I think Aquaman is the better collection for Throne of Atlantis, as it contains the prologue issue. * I really hope the omitted Aquaman issues are collected in the next volume. I especially want to read the villains month issues, which Johns co-wrote. Hopefully they just skipped them in volume 4, because otherwise they coudn't have collected Death of a King in one volume. * The JSA omnibus looks spectacular. I have most of the issues contained in one form or another, but I am really thinking about getting this one to have it all in one place. Also: Amazon lists the Katana paperback with an August, 26th date, which means it should be distributet via Diamond by August, 20th. So my guess is, it will be resolicited with the DC solits for July 2014. Guesses as to why the resolicit? Well, isn't it pretty normal that a collection is moved back when new content is included that arrives at a later date than the originally planned content? DC did it with a lot of collections in the past couple of years like Batman Inc., Vol. 2 or Frankenstein, Vol. 2. I do not read Katana, but #10 arrives in stores this month and the paperback originally should have been out in January. I don't think DC ever publishes collections after such a short period of time after the single issues. To my knowledge it was only moved this one time, so no big deal!? The original Katana solicit was only for the first six issues and the Villains Month Creeper issue. It's being resolicited to reflect it's getting all 10 issues and the Creeper issue. You'll probably see Vibe do the same thing. I really hope that's an error with the Deadman Book Five TP solit. 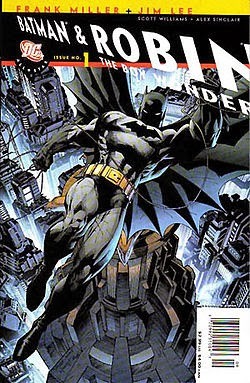 He first appears in issue 84 of the series. It would be weird not to have that issue included. Part of me feels good that a complete edition of Final Crisis is available. I didn't feel that the Batman issues really add too much to the story, but the pages from DC Universe 0 added will be a fine improvement. Part of me feels that this is a slap to the readers who put out their US$30 to buy the first run Hardcover which did not have a 3-D glasses section (a cheaper hardcover edition of Superman: Last Son had them) and no DCU 0. Part of you is RIGHT ON THE MONEY. I just bought a new print of the sofcover edition (with the fugly new DC logo), and I feel RIPPED OFF. Maybe I'll wait until/if they re-release it with Morrison's Batman in omnibus editions.